First published in Prestige Magazine (July 2012 edition). In the marketing of brands, whether spirits or otherwise, endorsement is the key to the kingdom. We as consumers find a recommendation – be it from a friend, from a celebrity, from the masses, or from some other source to which we ascribe credibility – to be compellingly persuasive, perhaps even decisive, as we go about making our purchase decisions. And when considering the population of potential sources what could be more reassuringly credible than a competition, or, more specifically, the results thereof? In a sense these appeal to our baser, survival-of-the-fittest nature – an all-out duel, foe versus foe (well…foes), locked in combat for the ultimate prize – but they also serve a very rational purpose. Before letting loose with our lucre we need to know which is best from the sometimes confusing array of options with which we’ve been presented. A competition for distilled spirits (wine would be similar) works something like this: a fee is charged per entry, each of which would then be submitted to a qualified panel of judges for assessment, at the conclusion of which an award, typically a medal, would then be conferred upon each winner (and often multiple runners-up) in various categories. Ostensibly this is a good thing. It appears to give us the basis upon which to make that judicious choice for which we are continually striving. If I want vodka wouldn’t it serve my purposes to know which – from amongst the dozens of brands clamouring for validation on the bottle-store shelves – is the gold medallist, the best of the best? When though are things ever as they seem…? Here then is the case for and against spirits awards, and, following thereafter, should one be inclined towards the argument for the former, a brief feature on one of the more notable competitions from which guidance might be derived. – The theoretical benefit already mentioned. In a perfect world a competition would give us the basis for a satisfying purchase decision. Hmm…a perfect world…I’m dubious already. – The outcome of a competition is an immediately understandable concept. There are gold, silver and bronze medallists, or an equivalently straightforward grading. This is something that can be readily processed by consumers. The apparent benefits are therefore easy to access. – Competitions are an efficient vehicle to bring new or little-known but worthy products, about which we might otherwise never have known, to our attention. They are, in moderation, a cost-effective promotional platform for the smaller players. – Competitions are usually independent and judged by credible experts. Whilst the calibre may vary from one to the other, one can generally be confident that selections are made without bias and with competence. – A spirits award is generally of questionable value, much like the Zimbabwean dollar. There are far too many competitions handing out far too many awards for these to be worth very much at all, to the extent that it prompted a prominent commentator to term the phenomenon “medal fatigue”. The “major” competitions alone number in the dozens and some these hand out awards to upward of 80% of entrants. – Why would a dominant brand – a Smirnoff, a Johnnie Walker, a Bacardi or an Absolut – enter a competition? Add the fact that there’s little to be gained to the potential for humiliation and what one gets is that many (most?) don’t. So what’s a victory worth if those who might reasonably be perceived to be the best aren’t even competing? Not too much I reckon. – Conversely some of the big players, those with access to bigger budgets, enter a truckload of their brands, perhaps those that are newer or smaller, into multiple competitions. Enter enough times in enough places with product of a reasonable standard, and a slew of awards is inevitable. This renders the more meritorious victories anonymous and makes a mockery of the entire system. – Taste is subjective, and there are extrinsic, emotive factors which play a significant role in satisfaction. Competitions are unhelpful in this regard and may even be counter-productive. If there was claim to be the most prestigious of spirits competitions, the IWSC has it secured. It would in all likelihood be the gold medallist in a competition for competitions. Established in 1969, and operating continuously since, the competition regularly draws entries from some 80 countries worldwide. It is truly as competitive a competition as one could hope to find. A competition of this nature is only as a good as the people involved, and this is where the IWSC really shows its class. The list of past presidents, extensive because the incumbent changes on an annual basis, makes for particularly interesting reading, with eminence clearly being a necessary criterion. South Africa’s sole representative was no less illustrious a person than Anton Rupert. The fact that he associated himself with the Competition speaks volumes. 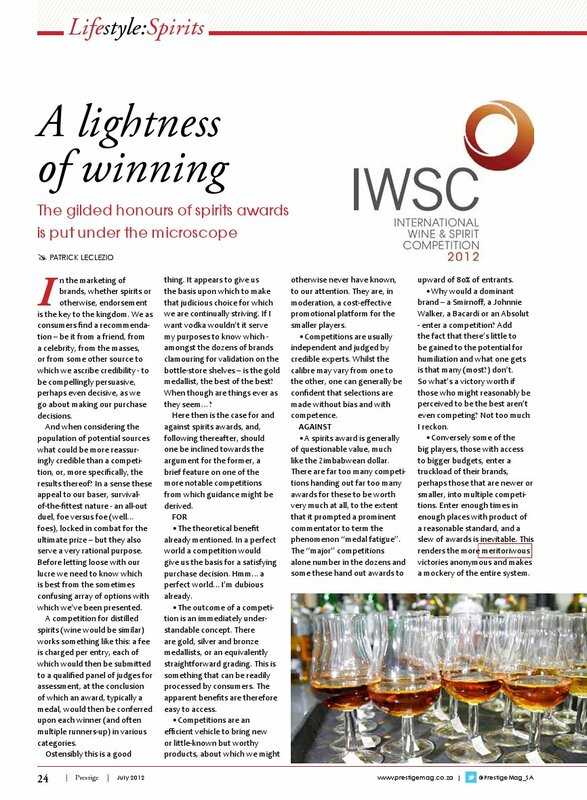 I’d say though that what really matters is the quality of the judging, the foundation for a competition’s credibility, and to this end the IWSC is able to call on an impressive breadth and depth of expertise. Entries are evaluated by panels drawn from a pool of 250 specialists from around the world. 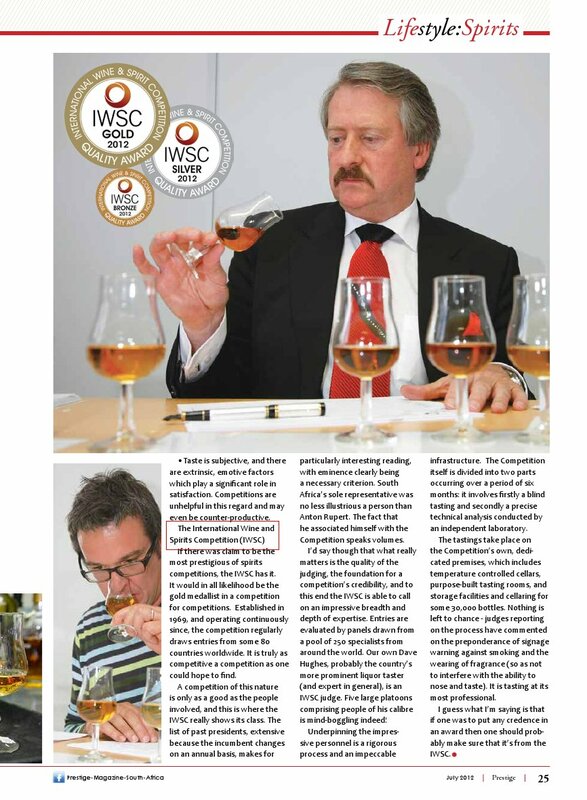 Our own Dave Hughes, probably the country’s more prominent liquor taster (and expert in general), is an IWSC judge. Five large platoons comprising people of his calibre is mind-boggling indeed! Underpinning the impressive personnel is a rigorous process and an impeccable infrastructure. The Competition itself is divided into two parts occurring over a period of six months: it involves firstly a blind tasting and secondly a precise technical analysis conducted by an independent laboratory. The tastings take place on the Competition’s own, dedicated premises, which includes temperature controlled cellars, purpose-built tasting rooms, and storage facilities and cellaring for some 30 000 bottles. Nothing is left to chance – judges reporting on the process have commented on the preponderance of signage warning against smoking and the wearing of fragrance (so as not to interfere with the ability to nose and taste). It is tasting at its most professional. I guess what I’m saying is that if one was to put any credence in an award then one should probably make sure that it’s from the IWSC. This entry was posted in Uncategorized and tagged Distilled spirits, IWSC. Bookmark the permalink.